Park Ridge is a charming bedroom community dotted with historic homes and family-oriented neighborhoods. Whether you’re coming or going from Park Ridge, the trusted professionals at Booth Movers can help ensure a smooth relocation. Since 1945, our Park Ridge moving company has aimed for 100% customer satisfaction. Much has changed in Park Ridge since we completed our first move, but our desire to exceed our customers’ expectations has stayed the same. We’re the smart choice for affordable, quality moving services! Residential Moving: Choose our Park Ridge moving services, and we’ll take good care of all the things you love from grandma’s china to your child’s latest work of art. Local Moving: Even if you’re only moving down the street, you can benefit from our affordable, reliable local moving services. Long-Distance Moving: Planning a long distance relocation? Don’t go it alone. Your move will be made much easier with our 70+ years of expertise on your side. International Moving: To you, an international move may seem an overwhelming challenge. To us, it’s just another day at the office! Full-Service Moving:From packing the first box to cleaning up after the move is complete; our full-service moving takes care of every detail. Commercial Moving: Our commercial services have earned the same positive reviews as are residential services. Count on our Park Ridge movers to complete the move quickly and get you back to business. Specialized Moving: From cars and trucks to fine art and antiques, our specialized moving services are perfect for all the items that need a little extra care. Whether you’re planning a move down the street or to the other side of globe, our Park Ridge moving company is a smart choice. 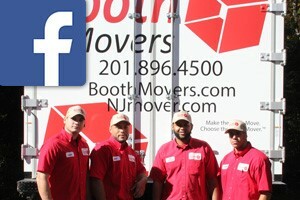 Call Booth Movers today to learn more, or fill out our brief online form to schedule your free, no-obligation estimate.